From one of the most important worship movements of our generation, the Vineyard, comes this study for every worship leader, musician, pastor, and member of your congregation. How Is Your Soul? 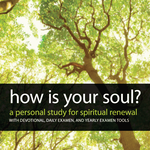 is a 4 week, personal study for spiritual renewal. These resources will equip your team to personally engage with God in a rich new way in the New Year – and for a lifetime. MORE ABOUT HOW IS YOUR SOUL? How Is Your Soul? Examine your life; ask the questions of the heart. How Is Your Family? Your first church; how can you tend carefully to their needs? How Is Your Work? We work to give; how do we carry Christ into our work? How Is Your Calling? Join God’s future; what is your part in God’s mission? 4 powerful, weekly studies with ideas from Ignatius, Susanna Wesley, Brother Lawrence, C.S. Lewis, John Wimber, Augustine, and more.